Aura carried an EUV experiment for solar and atmospheric investigations and a set of UV experiments for making stellar, zodiacal light, and integrated sky background and stellar observations. The spacecraft was spinning at about 0.25 rpm about an axis that was directed toward the sun. The data transmission rate was 256 b/s for real-time data and 11 kb/s for stored data at a telemetry frequency of 136.740 MHz. The memory capacity was 1.6 Mb. The cylindrically shaped satellite had a diameter of 0.8 m and a height of 0.7 m and weighed 106.6 kg. Four solar panels situated perpendicular to the cylindrical axis provided power for the mission. The stabilization system failed on December 28, 1976, thereby terminating operation of the spacecraft. 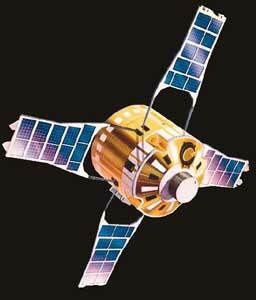 Signe 3 (Solar Interplanetary Gamma Ray Neutron Experiment) was a French satellite placed in orbit by the Soviet Union under a cooperative agreement. This satellite was part of the D2 series. It carried two scientific experiments, one for gamma-ray astronomy in the energy range 20 keV to 10 MeV, and one for continuous monitoring of the solar spectrum in two ultraviolet bands (1800 to 1950 Å and 2050 to 2200 Å). The main body of the spacecraft was a cylinder 70 cm in diameter and 81 cm in height. Electrical power was supplied by four solar panels extending 1.3 m from the spacecraft axis. The solar array provided 50 w to silver cadmium storage batteries. The telemetry equipment consisted of a PCM-PM system, using a 136.7 Mhz, 0.5 w transmitter. Real-time data rate was 256 bps. An onboard tape recorder extended the data coverage until its failure in March 1978. The command system operated at 148.5 MHz and provided 54 separate commands. The satellite axis was pointed towards the sun at a 10 deg angle with respect to the sun/earth line. Nitrogen gas jets were used to maintain this orientation.